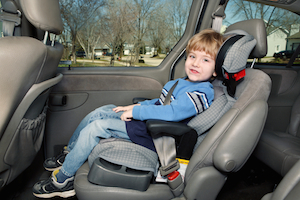 Booster Seats | Nashville Car Accident Lawyers The Law Offices of John Day, P.C. Contact Tennessee Auto Injury Attorney The Law Offices of John Day, P.C. Booster seats are required if the child is between the ages of 4 and 8 and is less than four feet, nine inches tall. The booster seat should meet Federal Motor Vehicle Safety Standards. The child should utilize the rear seat unless a rear seat is unavailable. If there is not a rear seat, then the booster seat should be used in accordance with the instructions of the vehicle manufacturer. Booster seats help insure good seat belt geometry i.e., that the belt is positioned properly across the body. Without good seat belt geometry, an occupant can suffer serious injuries in a crash. For instance, if the seat belt does not fit properly across the occupant’s hips, the occupant can submarine underneath the belt. Submarining injuries can be severe or fatal. Children and small women are most at risk for submarining injuries. In addition, if the belt does not fit properly across the shoulder of the occupant, seat belt roll-out can occur. In this scenario, the shoulder harness slips off the shoulder and the upper body is not properly restrained in the crash. This can cause the occupant’s head to strike something inside the vehicle. Even if the head is not injured as a result of seat belt roll-out, the impact forces will be absorbed entirely by the lap belt, which can often cause serious injuries to the internal organs. As with child seats, a violation of the booster seat provisions of the statute is a Class C misdemeanor. Fines and educational classes may be imposed on violators. If you or a loved one has been injured in a car accident and would like to discuss your case with one of our award-winning lawyers, please call us anytime at 615-742-4880 or toll-free at 866.812.8787 for a free, no-obligation consultation. We handle all injury cases on a contingency basis so it will not cost you anything out of pocket to pursue your legal rights.